This year we are back at Velocity Conference San Jose – You can visit us at booth #812 we will be showing off the latest FusionReactor developments and features to help developers fix problems faster! To celebrate this we are giving away a free ticket for Velocity Conference, San Jose, California. 1) Start a trial of FusionReactor and send us a screenshot of your activation Menu / About Page. 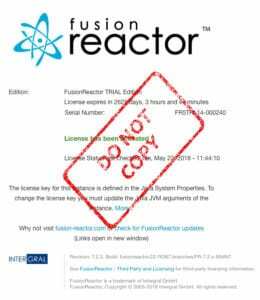 Send the screenshot to sales@fusion-reactor.com, the version must be FusionReactor 7.2.3 or higher. We will be announcing the winner on, Friday 1st June, this will give the winner enough time to organize flights and accommodation.